So thankful for the men and women who add to and sacrifice from busy lives and ministries to pour out their gifts at Emmaus! Miss Pam is still with us persevering through the works of Paul, Dr. Jeff Mansell, executive director of Seven Baskets Ministries and teaching for Indiana Wesleyan University completed his course on the Evangelistic Mandate of the Church, and Pastor Adam Godbold of Georgia took our students though the first half of the Doctrine of Holiness course. With seven littles under eleven and a church at home, he headed back yesterday, and Pastor Marshall Daigre will pick up where he left off for the second week! Hearing these visiting men and women preach in chapel just moves me more than anything…it is worship, fresh and good teaching, in my heart language, something that is hard to find in Haiti unless you’re at Emmaus during VP season. What a gift to hear the Gospel in many languages, many times throughout each week. I was particularly and unexpectedly moved yesterday in chapel before Jeff got to the pulpit. It was time for the pastoral prayer on English chapel day, and Jean-William led us in his earnest and plain-spoken English. Little by little we prayed through His world, through His hands…students and staff and visitors and Haiti and then on…on to war torn and persecuted countries, one after another, on to hurting people in hurting places, on to the men and women living and giving the Gospel in those places…all in Jean-Williams fourth language, beautifully child-like faith. What a gift to bow together…to break together…to remember together, to beg of Him, to come to Him, to honor Him, to ask of Him, to glorify Him. It was sweetness I haven’t experienced in my prayer life for many days…so thankful. I’m also so touched by how Jean-William’s heart and scope has GROWN since studying and pursing ministry in Italy, since praying to share the Gospel outside of our world…as he has changed, he leads our student body in thinking and praying outside of ourselves. What a gift serving is, how it grows us. I’m not quite sure how to wrap words around this, but you know me…I’ll try! Today I was sitting down with Camille, one of my favorite first year students…soft-spoken, clear-eyed, sweet-smiled, slow to speak and always visibly rolling his words over in his mind before he speaks them. He was telling me his story. Start to finish, highlights and prayers, dreams and visions. I’ve been asking a lot of questions of students lately and gathering up lots of little stories, but then here was Camille, and his story just wasn’t all that different than any old story. At first, I was a bit disappointed…because I’m just in awe of the amazing, mind-blowing, can’t-quite-wrap-our-culture-around-it stories, and here was Camille, talking to me almost like just any old kid I grew up with. But after we finished and he headed out, I went back through his story to fill in the language gaps (while they share their stories rapidly in Creole, I type them out in English, and then clean up any language blocks after). As I reverently worked to well-articulate this man’s story…his STORY…his journey with God, his path of calling…not much different than any story from my own culture, I was very hit with the sameness of us all. It’s easy, even after 10 years, to feel like while we deeply love and appreciate those we are ministering to and with, we think, we speak, we history SO differently. Even how God has REACHED us is so different, the way God’s revealed himself to each of us, so different. And then sometimes, there is a moment where you realize, where you remember, that it’s ALL the same. Where he comes from, what he looks like, how our stories are different…it just really doesn’t matter. He’s just a person, like me, with a story, like me, with a God, MINE, too, wanting to be close, like I do, wanting to be found faithful, just like me. My heart, his heart, my story, his story, our God, our hearts…it is all the same. If we are in Christ, we all have the same story, void of culture…sinners saved by grace, striving for the kingdom come that is not yet…resting in the kingdom come that is already here, working together for His glory, to make Him known, to love people well. Camille and I (and you and the persecuted believer sister in Sudan, the praying-eyes-wide-open brother we have in Korea, the Christ-follower next door, next country, next continent), we’re foreign missionaries together, kingdom children of the one true Father, this world not our home. And remembering that is so vital. It sees through straw huts and strange clothes and weird foods and language struggles and skin colors and different upbringings and crazy pasts and cultures and instead remembers that He alone is God, that we are each made in His image, and that He is why. and how. and who. So. Meet my brother Camille. He is your brother, too. My mother and father are both Christians, and from the very beginning, all of us kids (I have three sisters and a brother) grew up in church. Everytime the church was open, we were there. My dad drove a bus for a school, and my mom was a seamstress. When I was about 10 years old, my father spoke to me about my relationship with Jesus, and explained to me that even though we were a family of believers, I still needed to decide for myself, and still needed Christ’s salvation for my sins and life. He prayed with me that day and I was so happy to be a true believer. From the time I was small, every Monday night there was a prayer group, a small group, that meets in my house. My father always leads this group, and one day when I was 14 or 15, the member who was going to share a short devotional thought from Scripture wasn’t there. My father asked me if I would like to share something from my personal time in the Bible. I shared for a few minutes about what I was learning, and after that I made sure I was always ready to share what God was teaching me. In my Sunday school class, later in youth group, some Monday nights, and even sometimes in special services at church, I started having opportunities to share the Gospel, and people started asking me to more and more. Around the same time, there was a series of spiritual attacks happening in my community, and one after another, several small children were killed in a matter of months. I remembering feeling SO burdened, and everyone talked about the demonic attacks as if there was nothing to be done. I started a small prayer group then, made up of other children and youth, and we focused all our prayers on the protection of the children in our community, that God would be powerful and protect them against all spiritual attacks, and he HAS. In 6th grade, one night I had this dream, in which a person appeared to me holding out a Bible, and told me to take it. I held the Bible, and the person told me to take it everywhere. Another friend came to me, and he said, “Look, you’ve got to get studying. God’s got a plan for you to share the Gospel throughout Haiti, and it’s time to start. There’s only two places you can go. I want you to go and visit them both, and then tell me where you’re going. So I went to Limbay and visited and asked questions, and I came to Emmaus and did the same, and I knew that Emmaus was where I wanted to be. I started in August of 2016, and right away, I knew God was calling me to EBS so that I can fulfill His calling for me to take His Word throughout Haiti. I loved the preaching class. Even though I’ve been sharing lessons and the Gospel for a long time, there are so many ways to do this better and more effectively, and that class is teaching me that. I also loved my Intro to the Old Testament class. The Old Testament is rarely preached from in Haiti because many people don’t understand it or feel that it is old truth, but not for today. My Intro to OT class showed me how the Gospel is entwined throughout the whole Bible, and how. I still live with my parents in my home, and I still work in the same church I grew up in. I still teach every Monday night at our small group, I still lead youth in praying for our children and youth, and I help lead services now and teach a Sunday School class in my church. I really feel I’m supposed to share the Word everywhere. I guess I’m an evangelist! Please pray for me, that I might persevere and be well-equipped for this calling He’s given me. Support a student like Camille. But today? Today was where it’s all at…today I left the finance pile on my desk and left a homeschool pile with Lauren (the daughter of two of our visiting professors whom the girls have deemed a far more fun teacher than mom), left a happy Nora with her beloved Gertha and did the most basic, fundamental, first thing we do at Emmaus after prayer: I just went to class. And it was so good. I wish I could have taken you. And I’m so THANKFUL that over 100 men and women from all across Haiti, most of for whom such education and equipping seemed IMPOSSIBLE, today, were there too. It was beautiful to hear Dr. Jerry Caskey, a man who is just never going to be content with how things are in the world, whose whole heart is so obviously dripping for Jesus that it pours out his eyes more than once or twice a lecture. He’s teaching Synoptic Gospels to our first year class, and today they were going through different kind of miracles and what they SAY, what they meant, what they mean. I could have stayed all ten days, it was so interesting, and relevant, and fresh. And it was beautiful to see Simeon translating the material and language and ideas as passionately as Jerry is. I was proud and I was thankful, because what good is bringing Jerry’s heart and mind and experience all the way here if nobody understands it? That’s a big calling our staff who translate take seriously. What’s more beautiful that this? What’s Haiti need more than this? What do I need more than this? An earnest, thorough, digging and receiving of the Word. And then there is Ms. Pam, who has been spending at least a month a year of her life at Emmaus since before Matt and I came in 2007. She wouldn’t tell you so, but she’s quite brilliant, and the students have finally stopped trying to stump this female who carries the reputation from year to year as one who can run rings of theology around anyone in this love-to-debate culture. This just encourages more good conversations in this Systematic Theology 2 class, and I loved watching her translator, Blaise, dig into his own Bible countless times when students couldn’t quite get deep enough, searching it out for himself, Pam, searching it out along with them. I love this second year class…they’ve never found a thing they can’t make fun, and I just relished this more the joy and community they have with each other. After being spread all over the last month, these brothers and sisters are obviously happy to be working together again. Talk about brains. I didn’t even try to figure out what these three were talking about, but with Fanfan stepping into the Academic Dean position, and Dr. Joyce Thornton mentoring him through (while also running all of our masters programs and frequently teaching), I’m just THANKFUL for the highly intelligent, faithful and detailed man Fanfan is and the brilliant, no-nonsense, get-it-done woman Joyce is (as long as she has an unending supply of coke and coffee 🙂 to come alongside Matt and HELP. Like, really really help. And I KNEW when I passed through the cafeteria that Edlin would be faithfully making his billionth gallon of juice, that Granny and Paulcine would be shredding their thousandth head of cabbage. And I knew they’d be chatting and laughing, because they always are…what a testimony. What a testimony of support ministry, of servant ministry, of faithful followers of Christ. I ended up in the library, always doubling as our only large classroom, which is necessary when what you see here is third year. What a joy it was for me to sit back and watch Larry and Verna (and really Leme, too) co-teach the music and theory class. Incredibly talented and culturally sensitive (Larry grew up in Haiti and just glows when he’s “home”) they have the joy of teaching an across-the-board major love of the Haitian Christian…MUSIC. There was lots of singing, lots of practicing, lots of conducting and testing and examples and nodding as techniques our pastors, worship leaders, and singers have been using for YEARS finally make sense, have a name, have a reason. Verna plays the opening chords for English hymns she knows that apply various theories, Larry belts out the name of the hymn in Creole, someone yells out the hymn number (not that it matters, because nobody has a need for their battered hymn books) and in a matter of seconds, the room is full of boisterous melody, strong and harmonious as most of the students clap or conduct in their seats, and Verna is laughing again with Leme, who may have lost his voice by the end of this week. I really could have just sat in that worship all day if I hadn’t already spent so much time in the other classes – there is no such thing as a half-hearted singer in Haiti, nor should there be when we worship in ANY country. It’s never forced but always ready, not about individual talent, but about a very deserving God, and somehow Haiti has wrapped it’s roots around the idea that worship is the same as prayer, prayer the same as worship. It makes for a holy class, as holy as the other’s digging deep in their Bibles. What a morning, one I am so thankful and grateful to have experienced and to be some small part of. As are you, as are you. Wish you were here. I’m off to the 1-6 pm combined masters class, with our MACL (Masters in the Arts of Christian Leadership) and our MED (Masters in Education) students come together for Dr. Joyce Thornton’s Fundamentals of Teaching class…better equipping over 40 principals, school directors, teachers and and school administrators from elementary schools, high schools, colleges and universities throughout Northern Haiti…what a need, what a gift. Imagine you have almost 200, almost 500, almost 1000 students at your school, very limited resources, and a staff of passionate but ill-equipped teachers looking to you to help them manage crowded classrooms, build good curriculum, help with students with special needs…and figure out how to pay for it all. There are courses you could take, degrees you could earn, equipping you could receive in Florida, in Tennessee, maybe even in the Dominican Republic…but your school doesn’t have the resources to send you, nor the two-four years to spare you, and continued education in your third or fourth language is a pretty daunting idea, anyway. Over the last many years, dozens of pastors and professionals in this exact situation have been passing by Emmaus, asking for HELP. The Department of Education has asked for help. Schools down the road both ways have asked for help. Alumni have been asking for help, and after years of praying and planning and dreaming, this January, by God’s great help, Emmaus began a Master’s in Education degree for these men and women, for these schools, for these thousands of children and young adults. Forty people registered the first week…6 of them government officials in Education, 3 of them from One Mission Society’s International School, and all forty principals, administrators, professors and educators in dozens of schools throughout the North. 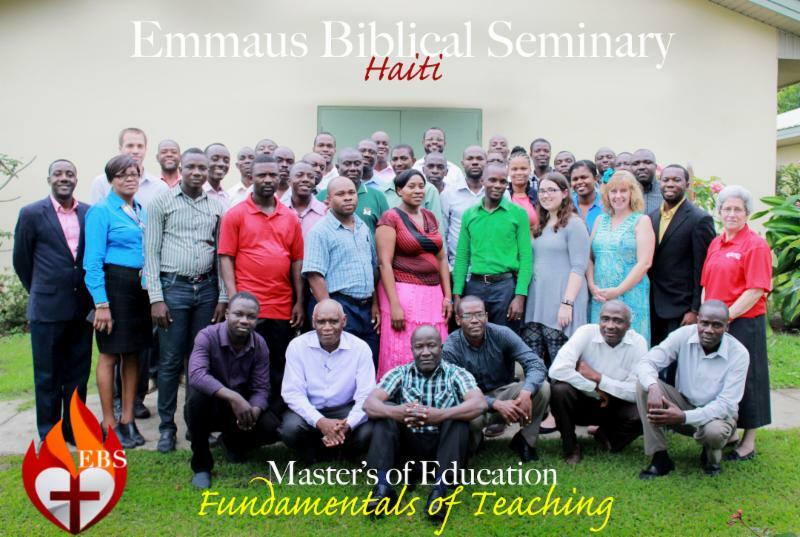 Not only is this a huge opportunity for Emmaus to equip men and women for His transformation in Haiti, but it’s also giving us a beautiful and consistent opportunity to share the Gospel and Gospel-based teaching with many of these professionals who are not believers…and therefore influence the thousands of students these forty represent. Because of donors like you supporting EBS and because of professors like Dr. Thornton who are generously giving of their time and experience and education, Emmaus is offering these classes for only $200 USD each (with textbooks), making this the most affordable–and only local–Master’s Degree in Education we’ve ever heard of! We are praising the Lord for this great need and dream being met and realized, for the staff and students that God has brought us, for the campus and staff we already have in place to make this possible, and for the way He has opened many doors. You can read a lot more about the statistical need Haiti has for this program, see a course list and learn more about the program itself here. It’s by prayer and help and God’s grace…Thank you for being a praying and sending part of people here at Emmaus…for the transformation of Haiti, and the world.